The multistate guide to emerald ash borer (EAB) insecticide treatment strategies has been revised and is available to download from the national EAB website, www.emeraldashborer,info. 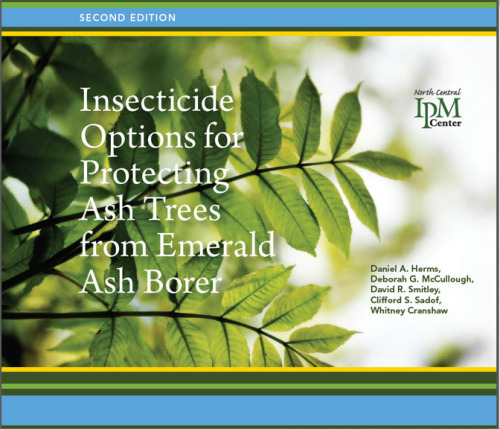 Look for "Insecticide Options for Protecting Ash Trees, 2nd Edition" in the middle of the page, or click on the image below to open the publication website. This North Central Region IPM publication was first released in 2009. The second edition includes research results and product information that has accumulated since then. The revised treatment guide includes information about foliar treatments (spraying the tree foliage at the time of beetle feeding in June) as a listed alternative. The authors state that a foliar application could be harmful due to drift. ISU Extension & Outreach Entomologists go one step further and discourage foliar applications, especially to tall trees. Emerald Ash Borer Update: Should Iowans Start Treating Their Ash Trees?